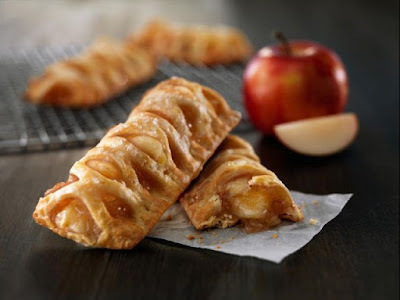 McDonald's switched up their baked apple pie with a new version that sports a lattice top and bigger chunks of apples. Compared to the previous version, the new pie features a sprinkled sugar topping (versus a sugar and cinnamon topping) and a heavier dose of cinnamon in the filling. The larger apple pieces are sliced rather than diced and draw from a number of American-grown apple varietals including Golden Delicious, Jonagold, Rome, Gala, Ida Red, and Fuji. The chain has been slowly rolling out the new pie this year and it is now available nationwide. Southern California was an early test market for the new apple pie and you can find my review of it here.